In the wake of the November elections, the Tea Party has gone from a well-funded, media-savvy, fringe group to become the new kids in the class of the 2011 Congress. Their presence is unpredictable and potentially explosive. 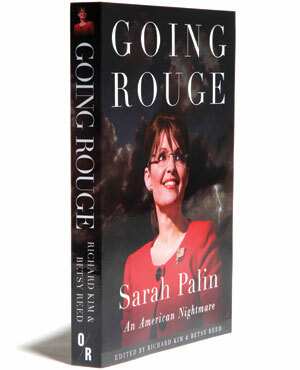 Sarah Palin looks increasingly likely to mount a bid for the Republican presidential nomination in 2012. Tea partiers Rand Paul, Mike Lee and Dan Coats now sit in the Senate alongside the GOP’s new poster boy, Marco Rubio. In total some 30 Tea Party supporters won seats in Congress. Their party is evidently here to stay – but what exactly does that mean for the future of the country? Just published by OR Books, At the Tea Party presents a lively and informed expose of this explosive new force in American politics. It doesn’t paint a pretty picture. Read these pages and you will come to understand the coalition of anti-abortion, pro-gun advocates who comprise the tea parties’ shock troops. You will discover what MSNBC contributor Melissa Harris-Lacewell and Going Rouge editors Rich Kim and Betsy Reed have to say about the racism, homophobia and sexism that fuels the tea party fizz. You will follow the money that flowed from the shadowy organizations of the super rich to pay for the ads that won the races. You will learn about the unscrupulous gold-peddlers who are virtually the sole underwriters of Glenn Beck’s Fox News show. And you will get the up-close-and-personal scoop on movement’s biggest stars – Sarah from Wasilla and the mercurial, crying clown, Glenn Beck. With contributions from a wide range of leading experts, At the Tea Party sorts the facts from the frenzy. Most importantly, it looks forward. Will the tea partiers in Congress launch a civil war within the Republican Party? Could they take over the GOP and end up running the country? And what role can the Left play in preventing the tea partiers from remaking America in their own fervid image? Combining investigative zeal, smart, hard facts, and a leavening of sharp wit and political passion, At the Tea Party stands out among books on the Tea Party phenomenon as a must-read for anyone interested in the turbulent future of American politics. Contributors include: Chip Berlet, W. Kamau Bell, Max Blumenthal, Eric Boehlert, Joanna Brooks, Rachel Carroll, Veronica Cassidy, Alexander Cockburn, Lisa Duggan, Barry Eisler, Bill Fletcher Jr., Greg Grandin, Glenn Greenwald, Arun Gupta, Melissa Harris-Lacewell, Peter Hart, Chris Hedges, Jim Hightower, Jack Hitt, Julie Ingersoll, Sarah Jaffe, Michael Johns, Richard Kim, Sally Kohn, David A. Love, Mike Madden, Jonathan Meadows, Stephanie Mencimer, Shannyn Moore, Bob Moser, Scot Nakagawa, Ed Ott, Rick Perlstein, Suzanne Pharr, Katha Pollitt, Sarah Posner, Tarso Ramos, Betsy Reed, Steve Rendall, Ruth Rosen, Rick Rowley, Ken Silverstein, Michael Tomasky, Rebecca Traister, Eric Ward, Marcy Westerling, Tim Wise, Richard Wolff, Kai Wright, JoAnn Wypijewski, Gary Younge, Alexander Zaitchik and Deanna Zandt. Laura Flanders is the host and founder of GRITtv and the author of Blue Grit and Bushwomen, a New York Times bestseller. The chatty man on the TV grins, and gives his audience a come-on wink. Fox News’ Channel’s Glenn Beck is about to let his audience in on a little secret. Notwithstanding a speckled yellow tie, a jauntily pinstriped shirt and baby blue framed eyeglasses, Beck stares out, severe. Funnily enough, not so long ago, that’s what I might have said about Glenn Beck. I might have said – and I heard plenty of people say – that Beck’s fans were simply wackos, wing-nuts, whitey-white fringe elements from people-scarce states. I might have said that people like that always fret when they lose power or jobs, or get smacked in the face by change, like the first non-white president and his family settling into the White House. I might have pointed out that in tough times, frustrated folks are always easy to fire up, and the filthy rich have always been wiling to pay for the match whenever regulators came anywhere near high office. Indeed, as Rick Perlstein, historian of the pre-Goldwater, Goldwater and Nixonian eras has remarked, outbreaks of reactionary ranting have a habit of accompanying liberal victories: it happened in 1993, 1977, ’71. So what is Glenn Beck saying this hot afternoon in August? As real unemployment stands at over 16 percent and an estimated 29 million Americans are looking for work, Beck’s telling his audience that the 1960s Weather Underground planted bombs and blew things up, and now they’re wielding power. This is a book for those who’d like some dots connected but may not have millions of willing “watch-dogs” to help them (or hours to spend watching Fox News Channel.) It’s a book for those who’d like a better grasp of what’s happening around them – the “Carls” in their own lives –and what, if they care to, they might do in response. Want to know whether to take Beck seriously? There are contributors here (like former CIA officer turned best-selling novelist Barry Eisler, or performer Kamau Bell) who’ll remind you that Beck’s an entertainer. At best a mediocre novelist (“more poodle than panther” as Eisler puts it, in his scathing review of Beck’s novel “The Overton Window.”) Beck’s called himself every self-deprecating – as well as every self-aggrandizing –name, including “rodeo clown,” which actually nails it. Today Glenn Beck boasts a monthly audience of 30 million, a nationally syndicated talk radio show, a self-titled cable news show, six New York Times best-sellers and an activated cult (his “9/12 Project”) which shows up to his rallies with signs declaring “Beck/Palin 2012.” He is Fox’s prime preacher-recruiter-publicist for the Tea Parties, many of whose members, it seems, actually believe his stories. (Read JoAnn Wypijewski’s curious conversation with a tea partier.) But as Beck’s very unofficial biographer Alexander Zaitchek reminds us in a conversation with Rick Perlstein (reprinted here from GRITtv,) when it comes to politics, Glenn Beck’s a neophyte. When Bill Clinton was elected, Beck was drinking to excess, snorting cocaine and hustling for ratings as a goofy radio “zoo” morning host in marginal markets. Others made the rodeo in which Beck is clowning. Beck’s personal rodeo has been built by big business. First, by Clear Channel (the radio empire) and then News Corps (the TV, print & publishing monster owned by Rupert Murdoch.) Both are behemoths brought to us by politicians who have eviscerated congressional oversight of broadcasting, loosened the limits on media ownership and been rewarded generously by aspiring media monopolies as a consequence. There have long been paranoids with pamphlets. Ron Arnold, for example, at the Center for the Defense of Free Enterprise tried to scare the world about the left-wing terrorists long before Beck took up the task. Arnold was testifying in Congress about what he called “the Eco-Terror threat” when Beck was still boozing and snorting. When Beck trashed the Apollo Alliance and began his assault on Van Jones, Arnold gushed on his website: “Fox talk show star goes a little over the top, but seems to have been reading the [CDFE’s website].” But whereas Arnold took on activists at the edges, Beck goes after government officials. And it works. Arnold was to Earth First’s Judi Bari what Beck is to Van Jones (namely, a character assassin.) But baiting only works when someone takes the bait. In Jones’ case, the most powerful man in the world, the President of the United States went along with Van Jones’ resignation as Green Jobs Tsar. After the Jones case, Obama’s administration went one worse, letting the Agriculture Department’s Shirley Sherrod go when she came under attack, before even asking for her side of the story. Liberals too, can draw spidery maps of influence, and they have, tracing the links between private funders like the Bradley, Scaife, Olin and Koch families, and right-wing think-tanks, lobby groups and fake grassroots (“astro-turf”) organizations. Ideologically minded funders have long paid for influence in Washington and Beck feeds at a familiar food line. You only have to tune in to find out whose stuff he’s reading. As oil was tinting black the lungs of Gulf Coast shellfish in the summer of 2010, Beck was thanking Charles Koch – on the air – for helping him to pillory big-oil’s critics. The multi-billionaires behind Koch Industries (oil, gas and chemical guys who own the second largest privately held company in the country) have funded decades of anti-regulatory propaganda. And it’s worked. Koch funded propagandists from the Cato Institute or Reason Magazine have long been accepted as legitimate “experts” and embraced by mainstream journalists. With Fox and Beck, Koch et al have their own network and their own astro-turf. Americans for Prosperity and Freedom Works (both funded by Koch) called the first Tea Party rallies on tax day 2009; Beck talked it up and hosted live coverage on The Fox News Channel. Will Beck and the Tea Partiers claim seats in Congress? It’s possible. It’s also not, primarily the point. Congress – and the White House — cower plenty, already. (Just ask Van Jones, or Shirley Sherrod.) The fact that a housing bubble a bank collapse, an economic depression and two disastrous wars is being accompanied by a Right-wing revolt rather than a Left one, speaks to how well ensconced are the reactionaries. Beck isn’t the beginning; he’s the Becchanal. He, Palin and the Tea Parties are expressions of the riotous victory of the rule of the irrational over the rest of us. The rodeo clown’s job is to distract. The really dangerous bull that’s rushing at us today isn’t Beck, it’s a whole slew of once “fringe” ways of looking at the world that have become what he calls “Common Sense.” The idea that civil rights are special rights and regulations are theft; that taxes are bad for the economy and the poor are best helped by helping the rich…. In the absence of any more persuasive explanation for the situation so many are facing, what Lisa Duggan calls Beck’s “pedagogy of shock” works. This August, Carl turned 81. He’s still working with his hands, in an economy that’s driven wages for men like him down for his entire adulthood. Medicare is the first health insurance he says he’s ever had. He rents cheaply and devises good business plans that never get funded. While I see deregulation and globalization and the assault on workers as an explanation for his plight, he sees greedy union bosses, busy-body bureaucrats and lazy newcomers in business. When it comes to threats-that-we-face, I see war and the starving of a nation’s revenues for things like education and culture and health; I see the growing schism between America’s rich and poor; Carl sees government by pencil-pushers who’ve never met a payroll and the seizure of private assets by politicians like those who took over GM and punished British Petroleum. That Carl could have listened to Air America Radio plenty and yet fall for Beck, I take as a personal defeat (even if Air America never had the ad dollars or the production values or the corporate bank-rollers Clear Channel has.) Similarly, that anyone could be confused about what a Palin presidency might mean for women speaks volumes about how shallowly journalists cover women politicians. (See Sarah Jaffe, and Katha Pollitt and Shannyn More’s contributions here.) That so many women could be working their hearts out for Tea Parties speaks to how hungry many women still are for gratifying engagement – and how welcomed — or not — they’ve felt in other places. Alexander Cockburn’s contribution here takes a stab at what’s happened on the Left as the fringe-right went mainstream. While we’ve vilified people’s movements, we’ve permitted puppet armies to fight our political fights, funded and fenced-in by foundations and private interests. Chris Hedges hints at what’s needed to correct the balance, as does Bill Fletcher Jr in his short piece about the US Social Forum. Sally Kohn point out that however much Beck rails at community organizers, he is a pretty nifty organizer. The conversations from GRITtv, with a Tea Party leader and member of a white supremacist group are the kind of conversation I believe we need more of. I’m particularly happy to reproduce for the first time here, the transcript of a panel convened by the Western States Center in Portland, looking at fight-the-Right strategies of the past, present and future. Those on the Left can laugh all they like at the absurdity of Beck and his conspiratorial chalkboard dating maps. But they’d be better off figuring out how Beck’s megaphone grew so big while ours shrank so small. I hope this book is just a beginning.